A large, floating, one-eyed jellyfish who surrounds itself with a defensive barrier of smaller jelly blobs. One must defeat all the small blobs before attacking Wart directly. In ALttP, Wart is the boss of the second Dark World dungeon, the Swamp Palace, and is called Arrghus in the American version. In MM, he is the miniboss in 2 dungeons. Attack Pattern: Falls down from the ceiling with several things attached to himself (either Baries or Bubbles). In order to defeat it, the eye must be made visible and then hit with the sword or arrow. Quick Facts: Wart is also known as Arrghus in ALttP, in Japanese his name is Wart so why it was translated in ALttP to Arrghus is beyond me. Wart is the Boss of the Swamp Palace, plus he makes a return in the Palace of the Four Sword in the GBA version. 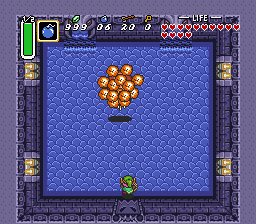 In ALttP Wart always comes with thirteen little minions to protect him. After these are all gone he will start ramming into walls trying to hit you. In the Palace of the Four Swords some little changes were made to make him more difficult to conquer. 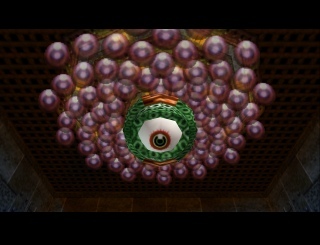 Quick Facts: The Wart in MM has about 100 purple ball (count them) covering his entire body, you're main objective was to take away enough of those balls to uncover his eye. This allowed you to shoot it with an arrow. Wart / Arrghus looks quite a lot like a floating squid or jellyfish, he can be found in the Swamp Palace and the Palace of the Four Sword. The last one only applies to the GBA version. The squid usually has about 13 little creatures with him, These can only be destroyed by using your hookshot on them to get them away from the flock. Then you can hack into them, destroying each of the little puffballs with two strikes of your Master Sword. After they are all gone Arrghus jumps up and falls down again, he will then start moving diagonally through the room. Hit him about eight times with the Master Sword to defeat it. When it is gone you get an Heart container and you will be able to free one of the 7 maidens. In the GBA version you will meet with Arrghus again in the Western wing of the Palace of the Four Sword. Only this time Arrghus has traded the puffballs for blue Bari, this will make the battle more difficult since these guys can electrocute you. Also some Kyameron will emerge in this room as well, these look like blue drops of water which are also located in the Swamp Palace. The third difference is that Arrghus now moves extremely fast in his last phase, making him rather hard to hit. If you defeat him here you get the green sword, which is one of the four that makes the Four Sword. In this game Wart makes his second appearance, he resides in the Great Bay Temple and the Secret Shrine in Ikana Valley. The one in the Great Bay Temple is guarding the Ice Arrows, which you need to complete the third temple in this game. The other Wart is one of the four mini bosses you need to defeat in order to get an Piece of Heart, to enter his room in the secret shrine you need 12 Heart Containers or else the Poe Collector won't let you in. The same strategy applies for both, when you enter his room Wart is hanging attached to the ceiling. At the moment you look him in the eye he will drop down and the battle commences. He has 100 nameless purple balls attached to him, which can be pulled away using Arrows, Deku Nuts, Sword attacks and The Deku Scrub's Spin Attack. Once a slime ball is on the loose it will start bouncing through the entire room and at some point will attach itself to Wart again. If you manage to hit it before the ball attaches it is destroyed. Once you clear off enough balls you can take a clear shot with your bow on Wart's eye. Do this three times and Wart will shake off the remaining balls and will start ramming walls just like ALttP. Hit him one more time with your sword to destroy him for once and for all. This creature is called Stone Arrghus in the English Version of this game, for its body is covered in stone. A boomerang will pull the eyed-rocks off of Arrghus. you can attack the eye. The name Arrghus was actually made up by the English translators since his real name is WÂTO (Wart). This makes sense, because Majora's Mask has a very similar enemy that was called Wart. Therefore, it is not difficult to believe that Arrghus and Wart are one and the same creature. Its name was changed again in the French version. This page was last modified on 17 April 2006, at 18:15.